From the Baldwin County Courthouse, go east on Hancock St. one block. Turn right (south) on Wayne St., which becomes Business 441S. Follow Business 441S for approximately 4 miles to the intersection of Hwys 441 and 243. At this intersection, 441S goes left and highway 243 (the Gordon Highway) goes straight. Go straight and follow 243 south. Go 5.1 miles on the Gordon Highway to J.F. Hall Road. Turn right. Go 0.2 of a mile and take the dirt road through the woods to the left. If you cannot find the dirt road and reach the railroad tracks, backtrack 0.2 mile to the dirt road. 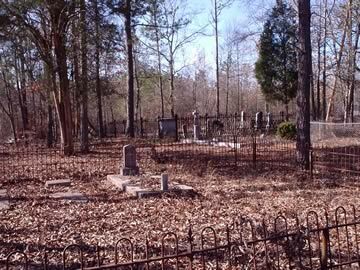 Once on the dirt road, the cemetery is less than 0.1 mile and on the right. The iron fences of the cemetery are partially visible from J.F. Hall Road. This church was built by Henry Stevens and his wife and was named after Henry Stevens' mother, as per the church Bible in the possession of Mrs. John Grant, Jr.
Co. K. 4th Ala. Inf. Pillow has d. year as 1922. Headstone and slab have d. year as 1921. Correct is 1921. Ga. 2nd Lieut, 64 Inf., 7 Div. At least 7 unmarked graves. One date only. Per TT. Not found in 1991. On same gravestone as Julia Antoinette Stevens. On same gravestone as John Henry Stevens. d/o J.H. and Julia Stevens. s/o J.H. and J.A. Stevens Marked as d. 1883 on grave. per TT. Not found in 1991 indexing. and Margaret No death date.